Shalice Coutu’s vision of accessible urban architecture was made possible through the critical student support provided by the Boundless campaign. Shalice Coutu is from Prince Albert, a small city of 35,000 in central Saskatchewan. Growing up, she was no stranger to the social side-effects of inequality. Then, as a budding student, her experience growing up helped form her passion for accessible architecture. “Coming from a small town in Saskatchewan that definitely has its share of poverty—I’m not oblivious to poverty around me, and I make a point to help those people,” she says. Part Métis, Coutu recently graduated in architectural studies from the University of Toronto’s John H. Daniels Faculty of Architecture, Landscape, and Design with support that included the Rosalind Bennett Scholarship. She plans to one day apply what she’s learned to improving the lives of Canadians through built environments that serve the needs of the most vulnerable. 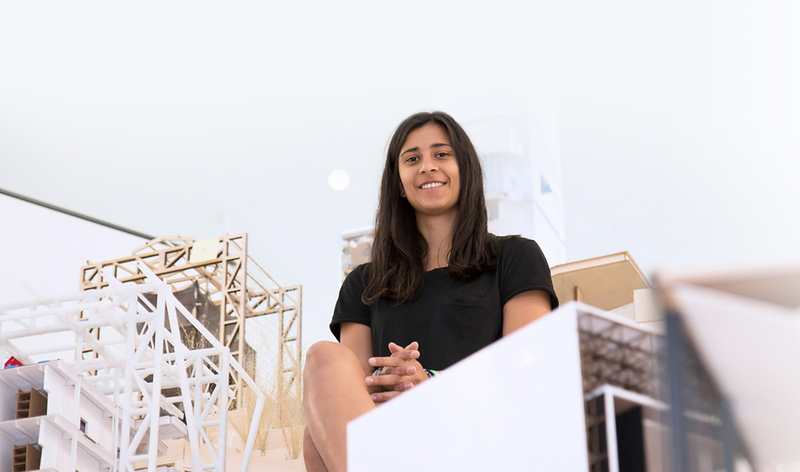 “I’m not in it necessarily for the building and the art form of architecture, but more to make people’s lives better,” says Coutu, who is continuing her studies at U of T, pursuing a master’s degree in architecture. And she has already experienced the positive role architecture can play, having spent one summer working at an architecture firm in her home province where she contributed to the design of a daycare centre for children with complex medical needs. “We showed the daycare’s CEO the rendering, and she actually started tearing up… it was such an amazing moment that made me realize why I was in architecture,” Coutu recalls. Coutu’s current success includes former professors crediting her with changing their views on urban architectural design. She in turn credits her scholarships, donor-supported awards among them, not only with helping her attend U of T, but also with inspiring her on an ambitious and rewarding career path. That includes returning to the prairie provinces to design for Indigenous communities.